Earlier this summer, three architectural firms were tasked with reinventing the US Capitol's public spaces in a sustainable and secure way as part of the National Mall Design Contest. Now Gustafson Guthrie Nichol and Davis Brody Bond have released images of their winning plans to rehabilitate and refurbish the Union Square site of the National Mall, complete with a reflecting pool, a public performance space, and leveled terraces for more that 25 million annual visitors to enjoy. 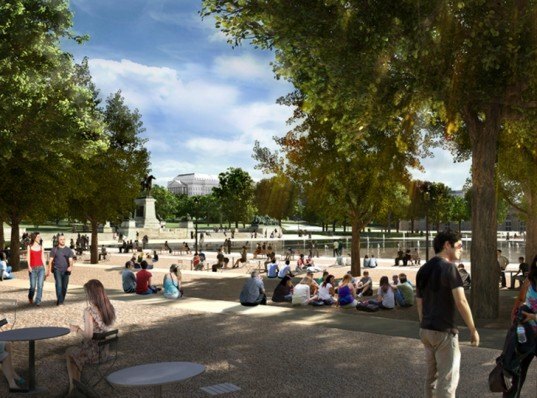 The international competition organized by the Trust for the National Mall, aims to rethink, restore, and rebuild the overused and neglected outdoor areas of the Capitol that have endured decades of visitor wear and tear. A jury of eight esteemed architects and designers hand-picked the winning designs that will revitalize not only Union Square, but also the Sylvan Theater and the Constitution Gardens. Nichol and Bond’s design for Union Square is a completely flexible space, open enough for large public gatherings, yet peaceful enough for congress workers and visitors to enjoy an outdoor break. The designers relocate the reflecting pond lying parallel to the Capitol to the first grassy panel on the Mall lawn. The simple move echoes the similar and iconic design at the other end of the lawn with the Lincoln Memorial and its own reflecting pool. The shallow pond features diagonal paved paths for visitors to emerge themselves in the monumental space. The pond can also be quickly and fully drained to make way for larger gathering or performance space. Various public spaces line the pool, including gardens, terraces, and leveled patios with seating areas. The designs work around the massive trees that already inhabit the space, creating both a modern and historic atmosphere. Their varying levels make Union Square a more comfortable space in which to gather for events, yet still an active, beautiful area when it is not accommodating a crowd. The international competition organized by the Trust for the National Mall, aimed to rethink, restore, and rebuild the overused and neglected outdoor areas of the Capitol that have endured decades of visitor wear and tear. A jury of eight esteemed architects and designers hand-picked the winning designs that will revitalize not only Union Square, but also the Sylvan Theater and the Constitution Gardens. Nichol and Bond's design for Union Square is a completely flexible space, open enough for large public gatherings, yet peaceful enough for congress workers and visitors to enjoy an outdoor break. 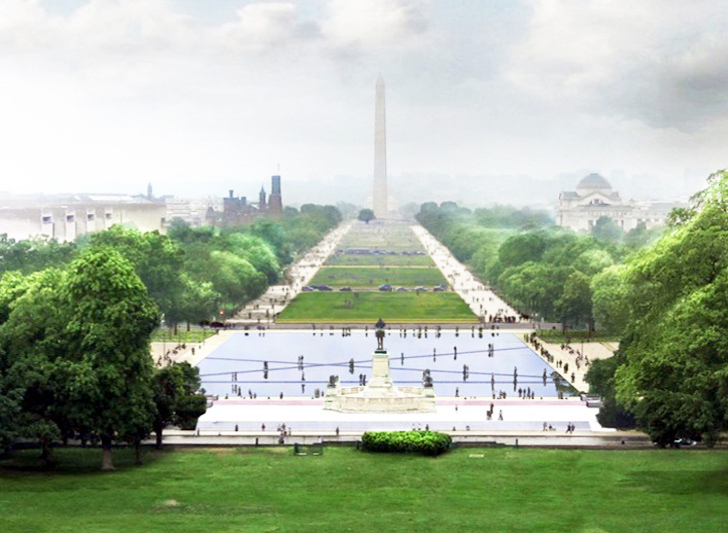 The designers relocate the reflecting pond lying parallel to the Capitol to the first grassy panel on the Mall lawn. The simple move echoes the similar and iconic design at the other end of the lawn with the Lincoln Memorial and its own reflecting pool. The shallow pond features diagonal paved paths for visitors to emerge themselves in the monumental space. The pond can also be quickly and fully drained to make way for larger gathering or performance space. Various public spaces line the pool, including gardens, terraces, and leveled patios with seating areas. The designs work around the massive trees that already inhabit the space, creating both a modern and historic atmosphere. Their varying levels make Union Square a more comfortable space in which to gather for events, yet still an active, beautiful area when it is not accommodating a crowd. The green features of the National Mall's new design are at the forefront of what the competition jury hoped would define the capitol's growing ideas. "Symbolically, it's seen as the center of America," Donald Stasney, Design Competition Manager said. "It should be sustainable and around for a long time -- its our postcard to the rest of the world."